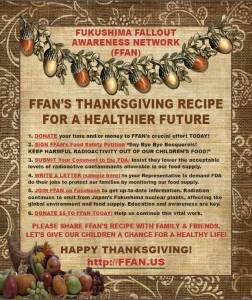 Home/Archive by Category" Radioactive Food"
Our friends at the Fukushima Fallout Awareness Network (FFAN) have planned for an entire week of calling U.S. Representatives, Senators, and more to make them aware of the problems posed by the current guidelines regarding cesium contamination. In light of disasters like the 3/11/2011 nuclear catastrophe in Fukushima, we need to pay more attention to contaminated food, not less. Guidelines set by the U.S. Food and Drug Administration (FDA) are some of the most lenient in the world, allowing levels of cesium in U.S. food that are banned in a wide variety of other countries, and that are twelve times higher than what is allowed in Japan. In March of 2013, FFAN and its allies, including Citizens for Health, filed an official Citizen Petition with the FDA urging them to lower the amount of cesium allowed in U.S. food to 5 becquerels per kilogram, but the FDA has yet to offer a substantive response. Ask your Representative and Senators to urge the FDA to respond to the petition. (Regulations.gov: Cesium petition and its related documents). Please take a few minutes and call your U.S. Representative and Senators. You can find their contact information here. For more background, and to get you energized to take action, check out this post by fellow FFAN coalition member, Beyond Nuclear. Start your conversation with your members of Congress with this sample language. Write a letter (sample here) to your Representative to demand that FDA do their job to protect our families by monitoring our food supply. Join FFAN on Facebook to get up-to-date information. Radiation continues to emit from Japan’s Fukushima nuclear plants, affecting the global environment and food supply. Education and awareness are key.